T/5 Jones killed in New Guinea. Rocky Mount Telegraph, 21 March 1944. Technician Fifth Grade Thomas Jones Jr. died in an automobile accident in New Guinea in March 1944. 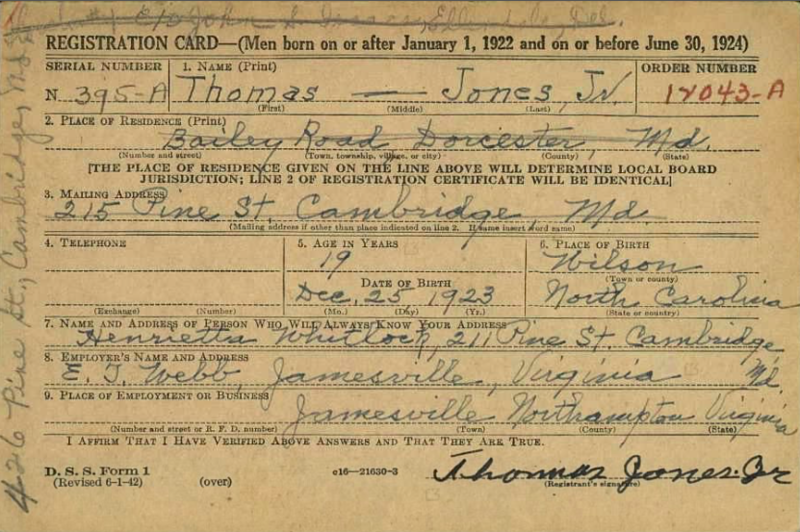 Jones registered for the draft in 1942 in Cambridge, Maryland. 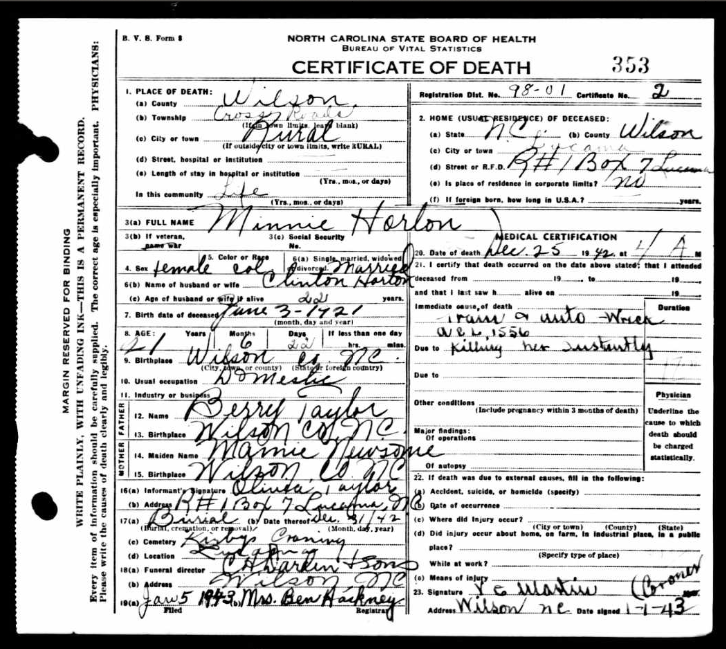 Per his registration card, he was born 25 December 1923 in Wilson; he lived at various locations in Cambridge and Dorchester, Maryland; his contact was Henrietta Whitlock; and he was employed by E.T. Webb, Jamesville, Virginia. His body was returned to Wilson for burial. Howard M. Fitts Sr. handled arrangements for a military headstone to mark Jones grave in Rest Haven cemetery. 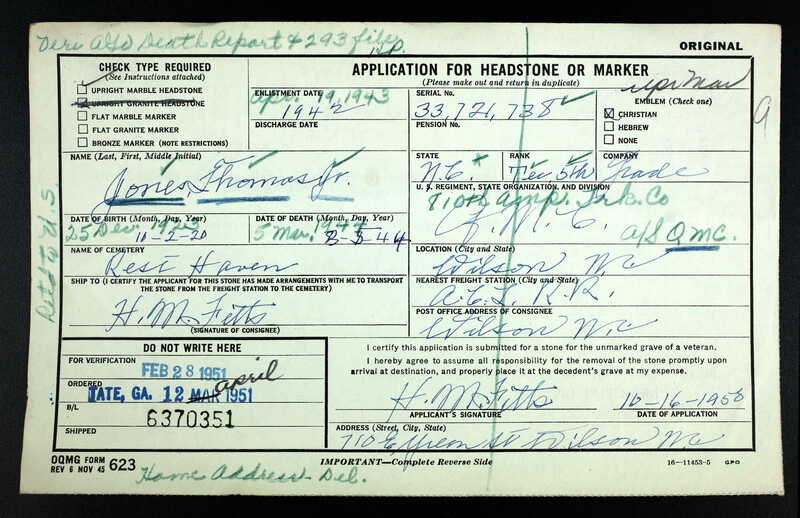 Though a corrected birth date is penciled in on the application, Jones’ stone was delivered with an incorrect date. This photo is found at www.findagrave.com. Wilson Times, 11 February 1919. Messenger “boy” Dempsey Lassiter was in fact more than 40 years old in 1919. Father and son killed in auto accident. Wilson Daily Times, 1 October 1934. In the 1880 census of Wilson township, Wilson County: farm laborer Luke Flemmons, 40; wife Emily, 45; and children James Flavius, 20, Willie, 15, Sarah, 12, Judge Thomas, 10, Henry, 6, Eddie, 4, Harriet, 3, and Mary E., 1. In the 1900 census of Black Creek township, Wilson County: widow Emily Fleming, 60, and children Harriet, 24, Judge, 23, and Sam, 12. In the 1910 census of Saratoga township, Wilson County: on Ellis Road, farmer Judge Fleming, 36; wife Mollie, 27; and children Lissie, 7, Sarah J., 3, Lula, 2 months, and Aaron, 6. In the 1920 census of Saratoga township, Wilson County: on Stantonsburg Road, farmer Judge Fleming, 49; wife Molly, 40; and children Lizzie, 18, Arron, 16, Sarah, 12, Lula, 10, Addie, 8, Jordan, 5, and John, 3. In the 1930 census of Gardners township, Wilson County: farmer Judge Fleming, 57; wife Mollie, 47; and children Arron, 25, Sarah J., 21, Lula, 20, Judge, 15, Johnie, 14, and Mary L., 6. 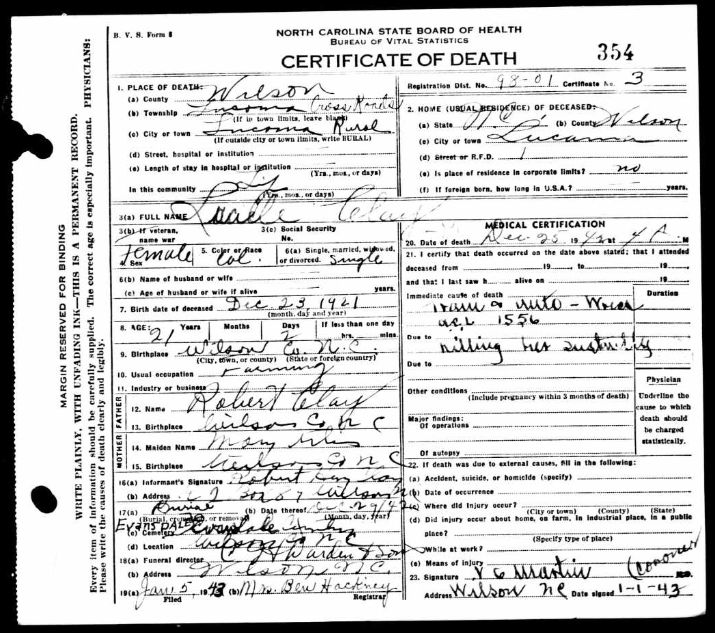 Judge Fleming died 29 September 1934 in Stantonsburg, Stantonsburg township, Wilson County. 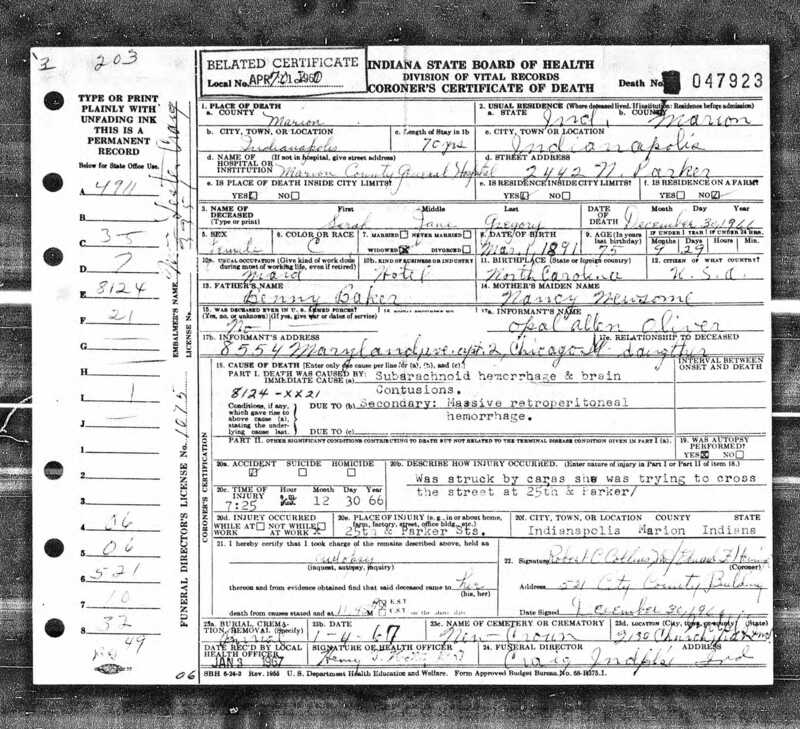 Per his death certificate, he was 65 years old; married to Mollie Fleming; was a farmer; was born in Wayne County to Luther Fleming and an unknown mother. Informant was Mollie Fleming. 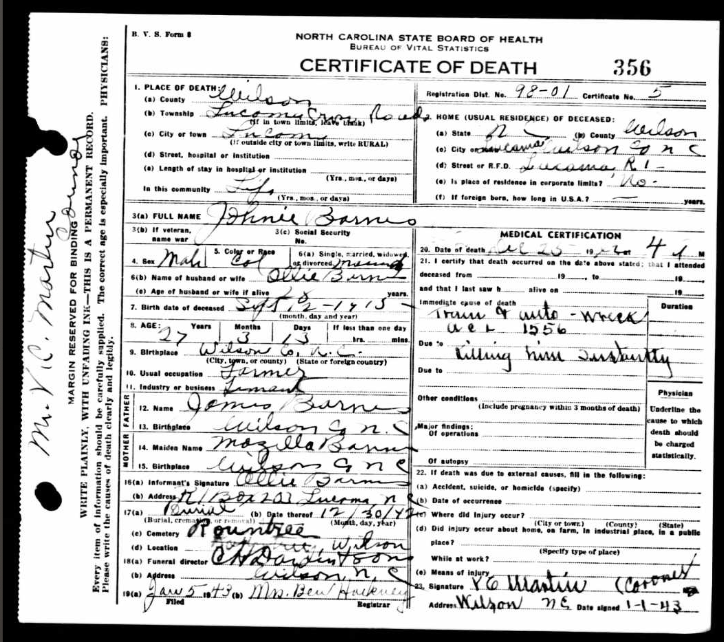 Johnnie Fleming died 29 September 1934 in Stantonsburg, Stantonsburg township, Wilson County. 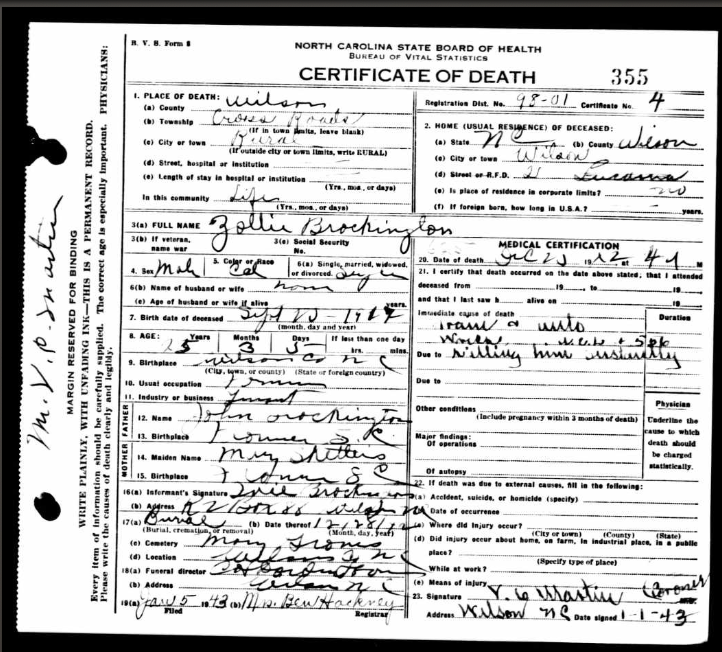 Per his death certificate, he was 18 years old, single, and born in Wilson County to Judge Fleming of Wayne County and Mollie Sutton of Greene County. Informant was Mollie Fleming. The obituary of Sarah Jane Gregory. Indianapolis Recorder, 14 January 1967. Sarah Baker, born 1892, daughter of Benny Baker and Nancy Newsom, married Joseph Gregory on 25 November 1912 in Indianapolis, Indiana. In the 1920 census of Indianapolis, Marion County, Indiana: at 1564 Park Avenue, rear, rented for $20/month, Kentucky-born Joe Gregory, 48, laborer, and wife Sarah, 45, servant, born in Tennessee [sic]. In the 1930 census of Indianapolis, Marion County, Indiana: at 1564 Park Avenue, rear, rented for $20/month, Kentucky-born Joe Gregory, 59, gardener, and wife Sarah, 31, maid, born in North Carolina. The dangerous lives of delivery boys. Wilson Daily Times, 18 July 1919. Wilson Daily Times, 9 January 1922. Just after Christmas 1948, an all-white jury acquitted Woodrow Taylor, a white service station operator, in the murder of Hugh Bynum, a black man. In a nutshell: Bynum and Taylor had a “conversation” about a pack of cigarettes. Bynum stepped out of the store. Taylor followed and asked, “You don’t think I’ll kill you?” Bynum said no. Taylor went back in and returned with a shotgun. Again: “You don’t think I’ll kill you?” And shot Bynum in the chest. Or, “the gun went off” — Taylor said it fired accidentally when he tried to set it down on a “cold drink crate.” And he denied aggressively questioning Bynum. The jury believed him. 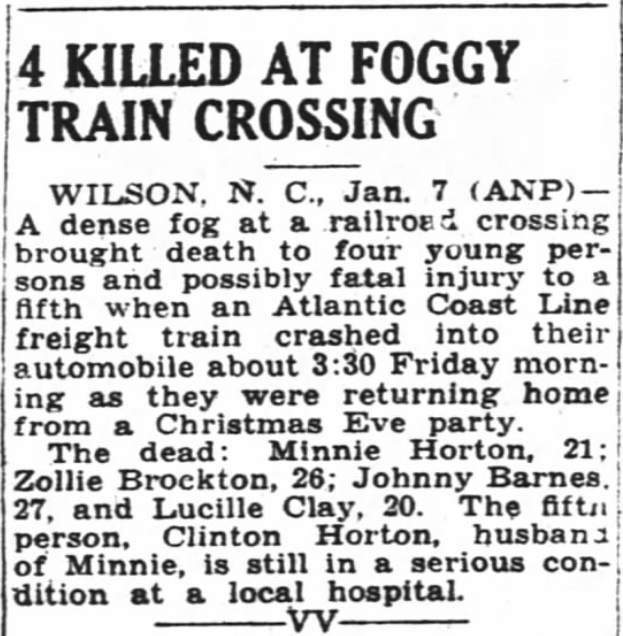 Wilson Daily Times, 29 December 1948. 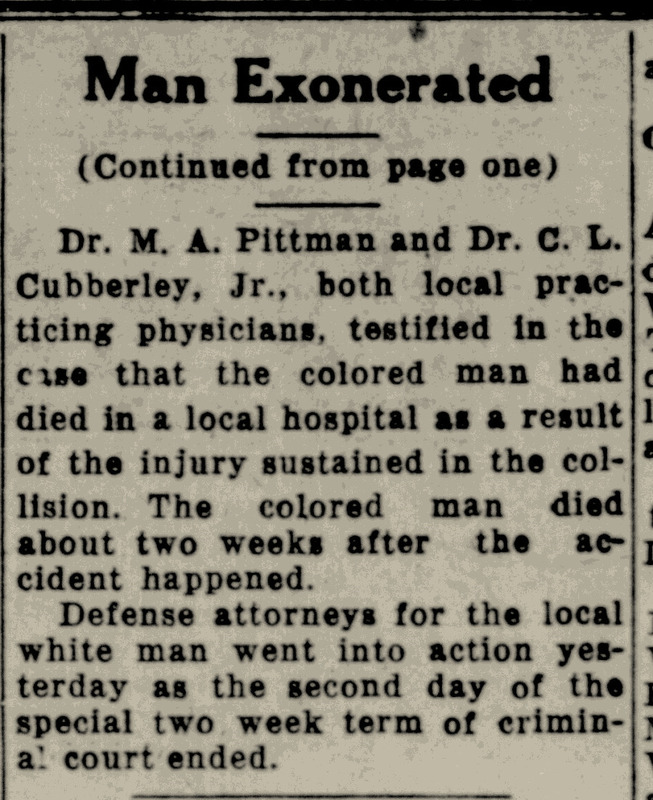 Bynum was not the only black man whose manner of death went before a jury that day. On 7 October 1947, William Cooper was thrown into the street at Nash and Pender Streets when M.O. 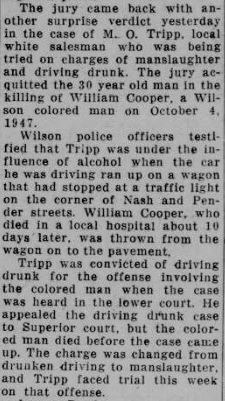 Tripp, driving drunk, struck his wagon. Cooper died two weeks of later of injuries sustained, and Tripp was charged with manslaughter. The Daily Times reported the verdict in this case the next day. Surprise. Wilson Daily Times, 30 December 1948. In the 1920 census of Saratoga township, Wilson County: farmer Lynn Bynum, 70; wife Lena, 50; and children Patience, 18, Lynn, 8, Harvey, 6, Hubert, 5, and Bunny, 3. In the 1940 census of Wilson, Wilson County: William F. Cooper, 43, delivery man for ice and coal company; wife Lillie, 30, cook; and step-daughter Anna Bobbitt, 16. Four killed at foggy crossing. Pittsburgh Courier, 9 January 1943. Minnie Horton — Minnie Taylor Horton was the daughter of Berry and Mamie Newsome Taylor and wife of Clinton Horton. Zollie Brockton — Zollie Brockington was the son of John and Mary Sketters Brockington. Johnny Barnes — Johnie Barnes was the son of James and Mozilla Barnes and husband of Ollie Barnes. Lucille Clay — Lucille Clay was the daughter of Robert and Mary Artis Clay. She celebrated her 21st birthday less than two days before she was killed. Clinton Horton — Clinton Horton, the sole survivor, recovered and apparently eventually left Wilson County. No death certificate is found for him there. 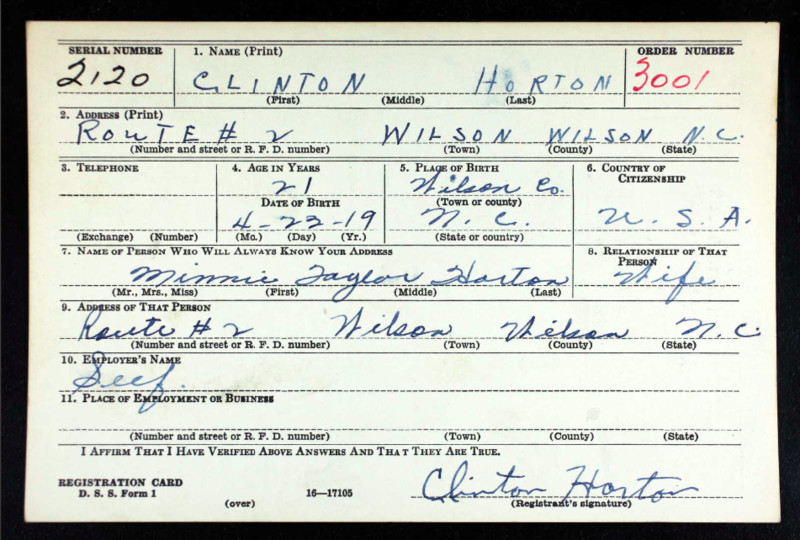 Here, however, is his World War II draft registration card, filed in 1940, when he and Minnie Taylor Horton were likely newly married. 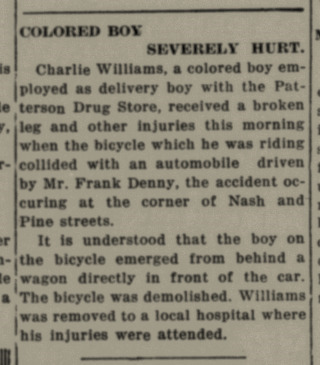 Wilson Daily Times, 10 March 1922. Blount Artis killed by auto. 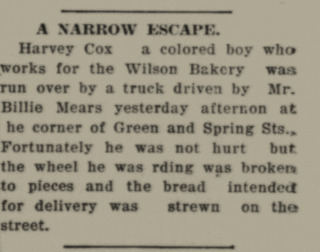 Greensboro Daily News, 27 April 1916. Blount Artis was the son of James and Amelia (Speight?) Artis. In the 1916 city directory of Wilson, his mother was listed as a laundress residing at 121 Ashe.